"We were able to share everyday experiences of addressing major environmental issues and identify areas of opportunity for future focus. This event highlights the importance of research excellence and the need for sound evidence in support of policy. Leading UK and Chinese environmental scientists are taking part in a Science to Policy Roundtable in Beijing this week to discuss issues surrounding water resources and governance for water security. Participants from the UK include the UK Science & Innovation Network, James Hutton Institute, Centre for Ecology & Hydrology and Defra. The event is organised by the Development Research Centre of the State Council of China and also features participants from several Chinese research institutes and universities including the Chinese Academy of Agricultural Sciences, the Research Centre for Eco-Environmental Sciences, and the Institute of Water Resources and Hydropower Research. The event was officially opened by Barbara Woodward, the British Ambassador to China. Delegates discussed building a UK-China environmental science to policy dialogue, delivering a platform for links between scientists, policy engineers and policy makers. A number of roundtable sessions have taken place, covering subjects such as flood and drought planning, links between land and water policy, governance and water policy, EU water quality policies, catchment management, natural capital, ecosystem responses and policy implementation. Speaking about the potential for further collaboration, Professor Gu Shuzhong, DRC State Council, said: "It has been a successful meeting, where we have discussed many current issues on water quality and quantity management and policy. It is beneficial to share expertise and learn from each other. 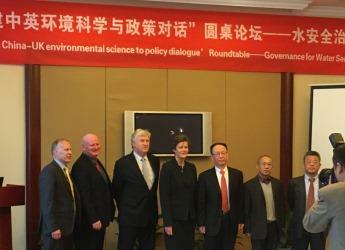 We are looking forward to productive future collaboration between UK and China scientists and policymakers."